In store promotions, fresh flowers and plants and new products!Rhubarb & Roses In store promotions, fresh flowers and plants and new products! In store promotions, fresh flowers and plants and new products! For a limited time only! FREE pack of 20 Danish design napkins with every purchase of our contemporary Cloche and Platter or Plate set. Offer available in-store and online! 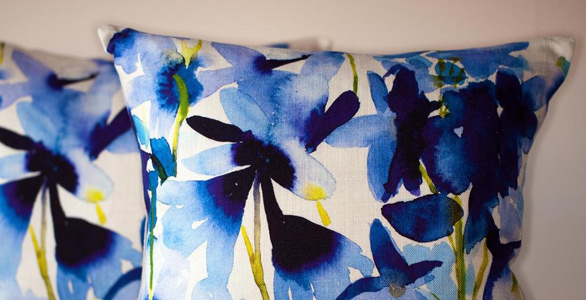 Limited stock left and available by award winning Scottish designer BlueBellGray! Shopper bags and cushions, still available to buy only just! Don’t wait and regret not buying once its gone its gone! Phone us on 01296 711158 to place immediate order. Re-usable gorgeous shopper bag! design printed onto laminated PP non woven material £18! We love ours great for picnics and putting your shopping in! Beautiful new lamps in-store NOW available to buy online soon! prices from £70 including linen lampshade. Lovely hydrangea plants in today! Will keep indoors for a few weeks then would love to be planted outside in nice moist soil! WE LOVE WATER!!! Dont forget to check out our online store, and please feel free to contact us if you have any questions about our products or floral design courses! Posted under General, News | Comments Off on In store promotions, fresh flowers and plants and new products!